The Restaurant Dieter saw a lot of contemptible food at the National Restaurant Association’s recent annual show at Chicago’s McCormick Place. But no exhibitor earned this dieter’s contempt like J&J Snack Foods Corp. of Pennsauken, N.J did. Its large booth offered super-pretzel poppers filled with cheddar or cream cheese; funnel cakes; churros; burritos; cookies; fried pies and pizza sticks. Nutritionally bankrupt pretzels are its specialty. 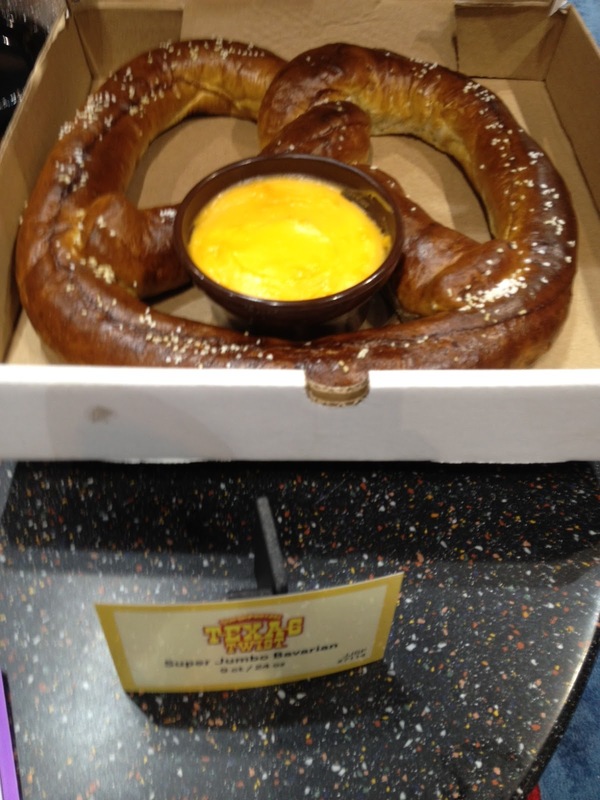 Incredibly disgusting was a 24-ounce pretzel served with some kind of liquid cheese. Is he kidding? This is a nightmare. It’s disgusting that this company waves the flag of freedom while undermining its citizens so thoroughly. Ain’t America grand? J&J makes the worst possible foods, the kind that are turning obesity into this nation’s most pressing problem. They focus on refined carbs, fat, salt and sugar. That addictive combination generated $55.1 million in net income on $744.1 revenues in fiscal 2011. Like any conglomerate, of course, J&J also has a healthier food line aimed at the school food service market, where — fortunately — government regulation is there to protect kids. Those products were featured at a separate booth that was one of 14 in the Healthier Kids Fare area. They included frozen juice cups and mini-fiber bars. But the kids brochure also concentrated on items like nutritionally bankrupt pretzels, churros and even funnel cakes. 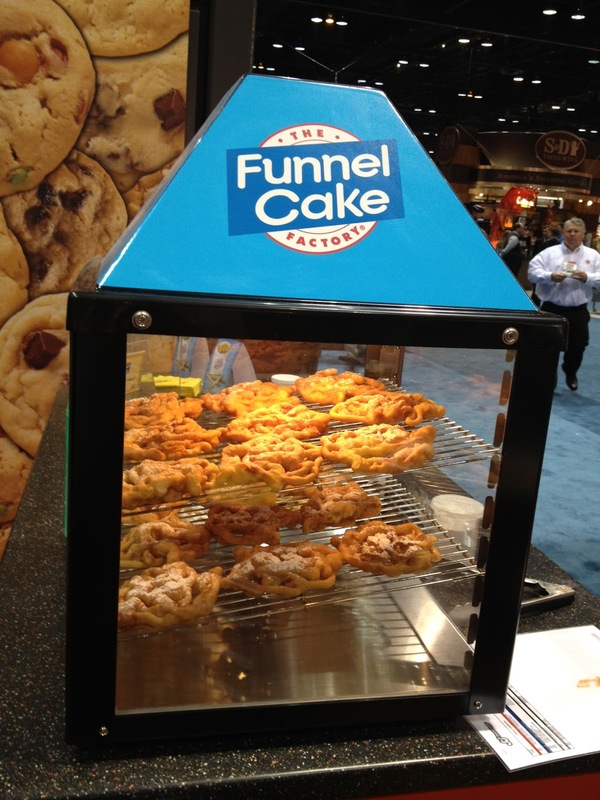 The brochure indicated that a funnel cake with 280 calories, 9 grams of fat and 1 gram of fiber was perfect for lunch and breakfast. Why the column marked “after school snack” was left unchecked is anyone’s guess. If you own stock in this company — it’s been trading at about $54 a share recently — I can only hope you have enough moral rectitude to organize a shareholder revolt. Restaurants equally love the concept. Without having to SAY “We’re cutting down portions because it’s expensive” a restaurant can. It’s perfect for these recessionary times. Normally, you’d think The Restaurant Dieter would applaud this trend. I’ve scolded restaurant chains such as The Cheesecake Factory for monster portions that, in part, fuel the nation’s obesity crisis. A fair number of diet authorities, in fact, recommend choosing both courses from the appetizers section of the menu. One issue with small plates is that they’re often over-the-top. The kitchen figures a diner is only getting a few bites, so whatever is on the plate must knock one’s socks off. A good example was a recent meal at Jaleo in Las Vegas. The kitchen seemed to be figuring: Why season a few grilled bell peppers lightly when a pool of olive oil will will make the dish so much richer flavorful? Another is that small plate menus tend to be light on vegetable offerings. They may have a salad, or as I learned on a recent visit to Atlanta’s The Sound Table, a single vegetable: cauliflower and brussels sprouts with lime, jalapeño, rice wine and cilantro. For a dieter, any menu that doesn’t have enough vegetable choices is a problem. Healthy and filling fiber is essential to walking away feeling satisfied. It spoils that whole conviviality thing.